Our quick trip to Texas to celebrate our uncle's birthday was three days of family togetherness centered around a lot of non-stop snacking, meal eating and being entertained by the boundless high powered energy of young children. The children seemed to be powered by the snacks they grabbed when passing through the kitchen, but by meal time, the kids were not hungry. This was the perfect reminder that snacks should fit into the day's nutrition plan to make sure that nutritional needs are being met without competing with meal time nutrition. 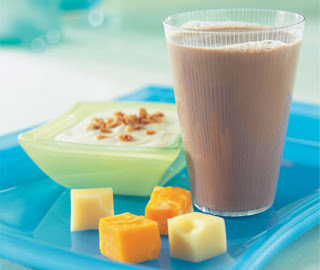 You can find more great recipes and snack ideas at http://www.midwestdairy.com or http://www.dairymakessense.com. I'm ready for a healthy snack---how about you?